You've probably heard about some of the amazing marketing automation you can do with HubSpot. And at this point in your buyer's journey, we're willing to guess you're pretty committed to the idea of getting HubSpot. The only thing stopping you is that you first want to explore which of HubSpot's three packages is the best fit for you. We get it, there's nothing worse than having buyer's remorse from a bad purchase decision. Purchase too light of a package, and you risk missing out on features that could greatly help improve your marketing and sales funnels. Buy too heavy of a package, and you end up spending a ton of money on features that aren't relevant to you or that you're not quite ready to use. So the question is: which HubSpot package is the right fit for your company? Should you start with Basic, see how it performs and upgrade to Pro down the road? Or, is your company ready to get started with Enterprise today and never look back? In this article, we're going to explore some of the features associated with each package type and help you decide which HubSpot package will help your company get the most out of marketing automation. Before we get started, check out the graphic below to get a basic idea of what the various packages offer. Furthermore, in this article we're going to discuss some of the most important features in each package and when we would recommend different packages based on an individual company's needs. 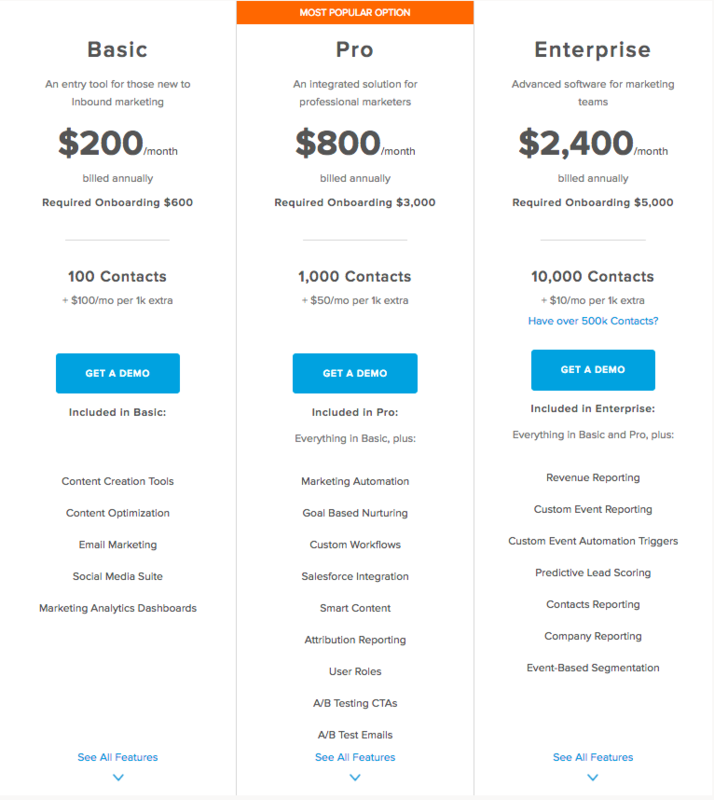 To see all of the features, visit HubSpot's Pricing page, locate the image below, and click on the blue "See All Features" button. 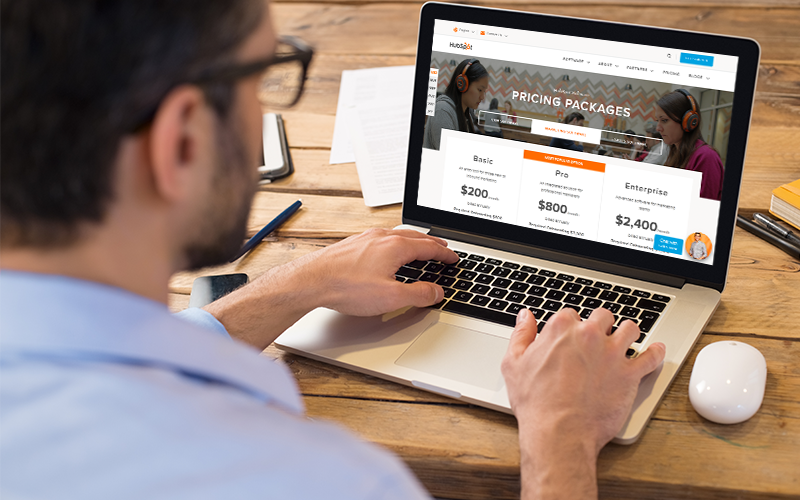 Don't let the name fool you, HubSpot's basic package is anything but basic. In fact, it's loaded with many awesome tools that any business would love to have. Take a look below to see just how many features this "basic" package has to offer. For starters, you get a lot of awesome blog tools. As blogging is the backbone of any true inbound marketing effort, you'll get tools that are incredibly helpful. If you opt to host your blog on HubSpot's Content Management System (CMS), you'll get a blog editor that will help you optimize your pages before you hit publish. All you have to do is enter in the keywords you're targeting for a particular post, and you'll get tons of optimization suggestions. It'll give you tips on making your titles better: have you used your keywords, is it too long or will it get truncated on a search engine result page? It'll remind you to customize your own meta description, add images and links to the body text, and make sure you're not stuffing your body text with too many of your keywords. Even if you're not on HubSpot's CMS, you can still look at your pages' SEO and marketing optimization. HubSpot will check your titles, meta descriptions, page load speed, images used, H1 headers, and whether you have any CTAs to capture leads. Other types of content you can create inside HubSpot are CTAs to entice leads to take you up on an offer, landing pages to promote those offers, and forms to capture their information as they convert. HubSpot also comes with an easy to use email tool to help you engage with your leads. HubSpot's email editor is very similar to their blog editor in that it helps you optimize your emails for best performance. You can set your social channels up to automatically publish articles across platforms as soon as you publish an article. This feature can be a great time saver for those that aren't as socially savvy and don't have the time to customize posts. For those that do have the time, you can still create posts for each of your channels in HubSpot. Rather than jumping from Twitter to Facebook to LinkedIn and back again, you can compose all your social messages right in HubSpot. You can even schedule posts in advance and tweak each post so that it best fits the chosen channel. Social monitoring lets you monitor activity on Twitter. Check to see if prospects are talking about your business or are tweeting about problems your company solves. You can take it further by monitoring your competitors' Twitter feeds and mentions of their companies. These are the tools that get people to opt into HubSpot in the first place. It's one thing to be able to create your content, but being able to accurately measure its effectiveness is what will keep you coming back to HubSpot. Find out where your traffic is coming from. Are your visitors finding you through organic search, paid search, finding you through other websites that link to you, from your social channels, or some other means? It's easy to break down in the Sources tool. All those blogs you created, emails you sent out, landing pages you optimized, and CTAs you slaved over, how effective are they performing? Each tool comes with a ton of metrics to help you measure what's working and what's not in your inbound efforts. There's even an often over-looked competitor tool that pulls in data from their websites to let you know how you stack up against them in categories like marketing, traffic rank, number of Facebook fans, and how many domains link to them. Who is HubSpot Basic a Good Fit For? Alright, so now that you understand that while it's called HubSpot Basic, it's a pretty robust tool. However, there are some limitations to it that make not as desirable as the other two packages. We'll get into those features when we talk about the Pro and Enterprise packages, so for now, who is HubSpot Basic a good fit for? This package is great for small businesses just breaking into the inbound marketing game. These are folks without a lot of experience doing inbound marketing. Maybe they haven't done much blogging yet or aren't sure if it's going to stick. Folks that want to test out all the features listed above (which are a lot) without getting overwhelmed by all the other features available in larger packages. It's also good for companies that have very few contacts in their database. Remember, HubSpot Basic allows up to 100 contacts before it starts charging you an additional $100 per 1K contacts. Once you have a couple thousand contacts, it will no longer make economic sense to stay on basic even if you're not ready for some of those other tools available in Pro. HubSpot Pro is the package that we end up recommending to about 80% of our clients. If you're serious about inbound marketing, it often makes sense to start on the package that gives you the best bang for your buck. The Pro package comes with all of the features listed in the basic package and then has even more additional features. If you're on Basic, you probably don't have a ton of contacts to begin with, making your email campaigns a little easier. However, once your contact list begins to grow and you want to keep leads in your database engaged with your company, marketing automation becomes critical. With marketing automation you can segment contacts in your database by whatever logic you see fit. From there, you can create emails that automatically send out to leads once they match the logic you established. For instance, say somebody fills out a form and downloads an ebook on your site. Now you have their email address, but what are you going to do with it? You've noticed that leads who downloaded that ebook were easier to convert down the road if they've viewed a video that relates to it, or they've read some other articles pertaining to the topic. With marketing automation, you can create workflows, or a chain of emails, that goes out to these folks. Maybe in the first email you want to send them the ebook they asked for along with some helpful articles. Maybe you want to wait a few days before asking them to view your video. You might want to collect more information on them by asking them to fill out a survey. Honestly, there are tons of reasons you'd want to continue engaging with your leads. But with marketing automation, you can write emails one time and have it automatically send out to people on a schedule of your choosing. Furthermore, you can automate internal emails to send to your sales folks. Once leads reach certain milestones or perform certain actions on your site, you can make sure to keep them in the loop by sending automated emails. Marketing automation is like having a salesperson that works for you 24 hours a day, 365 days of the year. You'll never have to worry about letting leads slip through the cracks again. Smart content allows you to personalize content to your visitors, leads, and current customers. And the cool thing is, you can decide what they see based on anything you know about them. Let's say you have a CTA at the end of an article asking a visitor to subscribe to your blog. If they were brand new to your site, this might be a great option to go with. But not everybody will be a first time visitor. If we already know they're a subscriber, wouldn't it make sense to have that CTA be for a downloadable ebook or to request a quote for your services? What about your forms? For an ebook download, you don't want to ask a ton of questions they have to answer before getting your book. Instead, you'll probably want their name, email address, and maybe a persona identifying question. But what about if they want to re-download that ebook later or convert on another offer? You wouldn't want them to fill out the exact same information again, would you? No. Instead, you can use smart form fields to queue up new questions so that you can progressively learn more about each contact. What about the form itself? Having longer forms sometimes makes sense for desktop users who can easily click into each field, but it can be annoying for mobile users. With smart forms, you can show the full form to desktop users and a truncated version to your mobile visitors. Instead of guessing what could happen if you made some subtle changes to your emails, CTAs, or landing pages, HubSpot makes it easy for you by allowing you to test variations of your content. Whether you want to test two completely different emails or just variations like subject lines or whether adding some personalization drives open rates or click-through rates, HubSpot makes it easy with A/B testing. Is that CTA color really the best choice? Test it out. Is that landing page headline enticing? Test it out. Just remember that when doing A/B testing to use best practices so that you can really drill down what's working and what needs improvement in your marketing efforts. Not all leads are created equal. In fact, just because somebody found your website and filled out a form doesn't mean they're going to be a good fit for your company. Lead scoring allows you to assign values to leads in your pipeline based on criteria you designate. That criteria can be based on information they've given you through a form, behaviors they've exhibited on your website, or how engaged with they've been through your social channels or email. Leads that have read tons of your website, downloaded multiple pieces of content, and have opened a bunch of your emails are leads that sound hot enough that if you put a salesperson in front of them, they'd probably close the deal a lot faster, right? Lead scoring is a great way to determine if a lead needs to be marketed a little more before they're ready for sales or if it's time for a salesperson to get them on the phone. With lead scoring, you can even assign negative points. Sure, that lead seems really hot and would love to do business with you, but maybe you only work with customers in your home state. It wouldn't make sense to give them high scores if they're not a good fit for you, would it? Lead scoring is a great tool to help you automatically determine the quality and readiness-to-buy of a lead. With HubSpot's Pro package, you have to manually assign the points you give out, which can be tricky at first and will come with a lot of trial and error as you dial in your scoring. For predictive lead scoring, you'll have to turn to the Enterprise package. Who is HubSpot Pro a Good Fit For? HubSpot Pro package is often the most recommended package for HubSpot users. If you've got a nice Rolodex of leads, you understand the principles of inbound marketing, and want to really crush things online while making it as easy as possible, HubSpot Pro is probably for you. Enterprise is the fullest, most comprehensive package HubSpot has to offer. However, with a $2,400/month starting price tag, is it the best choice for you? Here are some of the features Enterprise has that Pro is missing. The first question we ask clients weighing Pro vs Enterprise is: how many contacts do you have? If you've got a LOT of contacts in your database you need to be managed, Enterprise might be the right fit for you. If you look at the Pro package, you are allowed up to 1,000 contacts before you have to pay an additional $50 per batch of 1,000 contacts. Once you hit a couple of thousand contacts, that number can really start to add up. With Enterprise, you start with 10,000 allowable contacts and only $50 per batch of 1,000 more. If you operate a large website with multiple subdomains, Enterprise is probably the best fit. With the Pro package, you're allowed to add up to four subdomains, but with Enterprise, you can add as many subdomains as you have. Keep all of your marketing efforts under one roof. Aside from cheaper rates for more contacts, one of the main reasons companies turn to Enterprise is for more robust reporting features. Revenue Reports help you discover which of your marketing efforts are generating the most revenue. Attribution reports tells you which of your content is driving the most traffic, leads, and sales. If you want to know the most important pieces of your marketing funnel, attribution reports are a must. Create custom reporting on your entire contacts database. You can segment the companies in your database and track revenue. With Pro, we talked about how you can create your own scoring algorithm to determine which leads are red hot and which are lukewarm. But doing manual lead scoring requires a lot of time and effort as well as trial and error. Predictive lead scoring takes the guesswork out of which criteria you should use to score leads and how much weight you should assign to each property. With predictive lead scoring, an algorithm checks all the information your current customers have in common, as well what past leads that didn't close have in common. It looks at everything from what their responses were on forms, to behaviors they exhibited on your site, to social media information, and more. It then creates criteria for different quality leads (marketing qualified, sales qualified, etc) and lets you know which ones are hot and which are not (or not yet). Who is HubSpot Enterprise a Good Fit For? HubSpot Enterprise is for medium sized businesses doing major inbound work to corporate sized companies needing to manage and report on large swaths of contacts. If you're just getting started with inbound marketing or marketing automation, we'll probably recommend Pro or Basic to you. Exceptions would be for companies just getting started with inbound but have tons of contacts or multiple subdomains. Hopefully after reading this article, you have a pretty good idea of which HubSpot package you'll choose for your company. If you need help picking the right package and getting started with HubSpot or inbound marketing, we'd like you to know that we offer training services on all things HubSpot and Inbound marketing. Not only will we help you find the right package that fits your company's needs, we'll teach you the tools and strategies you'll need to crush the competition. Don't forget to visit our YouTube channel where we have over 200 videos on HubSpot's COS and CRM. If you've got a HubSpot question that starts with "How To" we've probably shot a tutorial answering your question. And finally, if you want to stay up to date on all the latest news about HubSpot and inbound marketing, check out our weekly podcast The Hubcast (available on iTunes, Stitcher, and Soundcloud) with hosts George B. Thomas and Marcus Sheridan. Hubcast 200: HubSpot Brain Teasers, Multilingual Love, & a Whole Lot of Gratitude!